Adult varied carpet beetles are about 1/16 to 1/8 inch long, and generally oval in appearance. The back of these insects are spotted with grey-yellow, brown and white scales. The larvae are 3/16 to ¼ inch long and wider at the end of the body then at the head. They are covered with a series of light and dark-brown stripes that run across the body. Carpet beetle larvae have three dense tufts of bristles at the rear end. Female carpet beetles lay about 40 eggs in a lifetime. The eggs hatch in 10 to 20 days, and the larvae develop in 222 to 323 days, remaining as pupae for 10 to 13 days. There is one generation of carpet beetles per year. The adult lives 14 to 44 days. 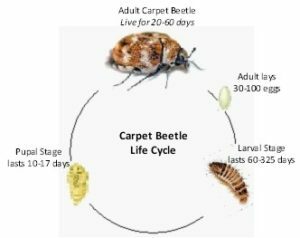 The carpet beetle larvae feed on natural fabrics, including carpets, woollens, skins, furs, cotton, stuffed animals, leather bindings on books, feathers, silk and plant products. Adults feed on pollen, are good fliers, and enter homes through open doors and windows. Years ago carpets were made of wool and this was the most common food-source for carpet beetles (hence their name) but nowadays, most carpets are made of synthetic fabric and carpet beetles will not feed off of unnatural fabric. The initial step in carpet beetle control is the correct identification of the pest, followed by a thorough investigation to identify and eliminate the sources of the infestation. Infested items should be discarded or exposed to high heat (a clothing drier) which would kill any live insects or eggs. Carpets, rugs, and clothing should be bushed or cleaned. Application of a residual insecticide in cracks, crevices and the immediate areas around the infestation may be necessary. Over the counter products used in an effort to self-treat will often repel the pest and cause them to scatter to other areas of the home. A professionally trained and licensed exterminator is your sure option to eradicate a carpet beetle infestation. Need help with Pest Control or Extermination? Call A to Z Pest Control 1-844-ATOZPEST or email us at service@atozpest.com. Adult flour beetles are red-brown, slender, and about 1/8-inch long. Both species (red and confused) look very similar, but can be distinguished by looking at the antennae. The confused flour beetle’s antennae gradually enlarge toward the tip, ending in a four segmented club. The red flour beetle’s antennae become club-like very quickly and the club has three segments. Over the span of the beetle’s lifetime, consisting of two to three years, females produce roughly 300 to 500 eggs. They lay two to three of these clear, white, sticky eggs daily in cracks, in bags, or trough the mesh of flour bags. The eggs hatch in 12 days and the larvae undergo 5 – 12 moults, completing development in about 30 days. The life cycle, egg to egg, can be completed in 49 to 90 days. Confused and red flour beetles are major pests when it comes to flour. They cannot feed on whole grains, but are found abundantly in grain dust, flour, dried fruit, nuts, chocolate, snuff, spices, rodent baits and drugs. Call A to Z Pest Control at 1-844-ATOZPEST or email us at service@atozpest.com. A to Z Pest Control services New Jersey and Philadelphia. If you have a problem with Bed Bugs, Termites, Ants, Rodents, Birds, or any other pest please contact us!